It wasn’t so long ago when Luka Modric’s long-range rifle pierced through Argentinean hearts. The silence amongst the Argentineans was deafening enough to transmit to the streets of Buenos Aires where even a pin drop could be heard from every corner. The funeral atmosphere was amplified in Argentina’s TyC Sports studio as they held a moment of silence after they were thwarted by Croatia in the Nizhny Novgorod Stadium. Although Argentina ended up qualifying, they could have maybe, just maybe gone all the way considering the fact that Denmark, Russia and England would have stood in their way. 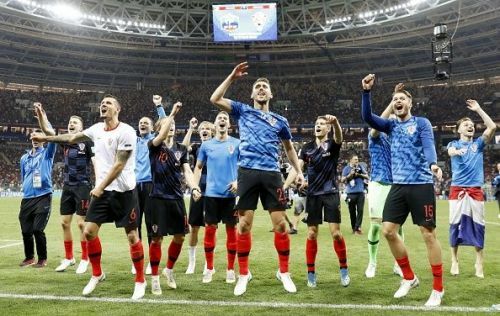 Croatia have soared over the hurdle of “what could have been” and qualified to the World Cup final against all odds. The Blazers have qualified for their first ever World Cup final and they are 90 minutes – potentially 120 minutes away from making history. These are three reasons why Luka Modric’s Croatia will be crowned 2018 FIFA World Cup champions. 17 years ago, the Croat army was involved in a war to ensure that Croatia are separated from Yugoslavia. All of the members of the Croatian team were alive during the war. These Croatian players know about the hitches in the history of their country and are willing to fight for their country. This fighting spirit has been augmented during the knockout stage and seems to be intensifying as the Croatians get closer to the much-coveted trophy. In the knockout phase, Croatia have battled against Denmark, Russia and England respectively. In each of these 3 battles, the Blazers went behind 1-0 and still managed to win. This proves that Zlatko Dalic has embedded a never die attitude in his players and they just do not know when to give up. Against the host nation Russia, Luka Modric made 15 recoveries – the most by any outfield player in this World Cup so far. Ivan Rakitic had a fever the night before their semi-final match against England and he still played 120 minutes in that match, coincidentally the match against England was his 70th game of the season against, proving why he is a true warrior. Coming into the semi-final tie against England, the Croatians had played 30 minutes more but looked like the team that really wanted to get to final; they fought for every ball and were very clinical in front of goal. The Croatians fit perfectly into the 'dark horse' tag and they look like a team who will fight till the very end.